I've made considerable progress in the past couple days. I've also verified that the hex distance is correct. Feeling pretty good now, so I'd like to share what the Stolen Lands look like at 12 mi /hex. 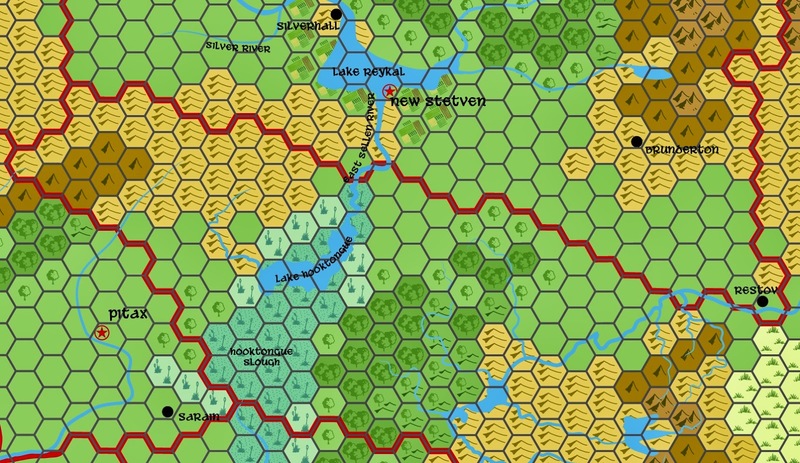 The Stolen Lands at 12 miles to the hex. Click to enlarge. There are borders, cities, labels and even farms now! The bottom right hand corner has the "good" savanna hex. There's a "bad' savanna hex for the northern end of Brevoy to convey the idea that the land is marginal at best there. The Slough also has two different swamp hexes. The darker hexes are navigable by flat boats while the lighter hexes are just your average swamp. In times of flood the lake expands to the south to flood the slough. I would love to have a copy of the map, even if its in beta! The short answer is that I used the Hooktongue slough and Lake Silverstep as a guide and then eyeballed it (sort of the middle option i mentioned). The long answer is lots of trial and error. Basically the previous post was a "proof-of-concept" that doing it without bias wouldn't get me a better result.